Charity Motorcycle Rides and fundraising events to explore, join and ride. Charity Motorcycle Rides is your spot to find a ride that benefits others as well as giving you the chance to ride with like minded bikers. There are so many great causes to ride for so why not get involved and join a Charity Motorcycle Ride today. Pay it Forward ->Share your Charity Motorcycle Ride with us. Do you have a Motorcycle Ride you want to share? Ride for Rescue Cats, June 27th, Almonte, ON. we are havng a bkiers service and blessing in ayr, ontario on sunday may 31/15. the service is open to all bikers. hope to see you there. 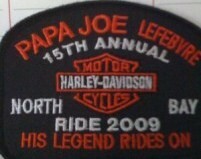 10th Annual "Ride for the Breath of Life"
Could you please replace last years poster with this years flyer.. Thanks! StoMp the Megaquarry: Calling all motorcycles and scooters! Burford Optimist "Friend of Youth Ride"
Papa Joe Lefebvre Ride After Papa Joe lost his battle with cancer in 1993, eight of his buddies got together a year later and rode their bikes in his memory. With this simple gesture, they began what would be the largest organized Charity Motorcycle Ride in North-eastern Ontario. Motorcycle Ride for Dad is the largest Motorcycle Ride for Prostate Cancer in Canada. Check it out here.